ProtoCasting From CAD to fully functional high-strength metal parts in days! A quick manufacturing facility coupling rapid prototyping and rapid investment casting (protocasting) and designed for high mix/low volume complex precision superalloy casting production. Prototyping and protocasting processes capable of consistently delivering low volume high quality metal parts within days of receiving a customer CAD model. Skilled personnel able to fabricate, finish and inspect high-quality metal castings to demanding industry specifications and proprietary customer requirements. RapidProtoCasting designed and constructed a facility focused on rapid manufacturing of metal prototypes for complex high-strength industrial, medical and aerospace parts. Our lean manufacturing express foundry was built around four flexible work cells allowing precise processing of small quantities of engineered casting designs to customer specific quality, inspection and test specifications. 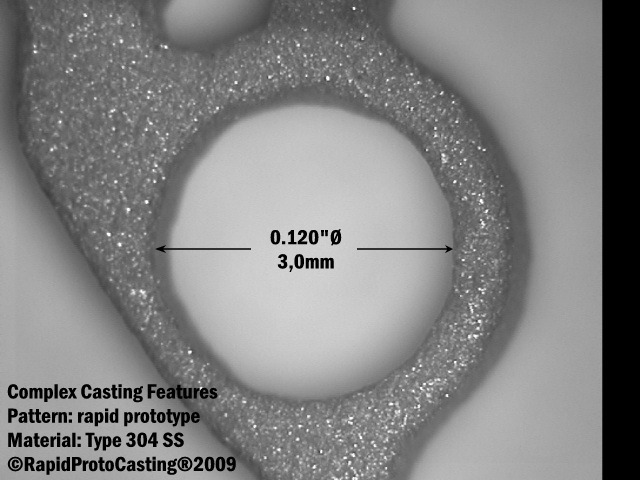 RapidProtoCasting delivers precision castings from in-stock alloys in as short as one day after receipt of a rapid prototype pattern and as little as four days after receipt of a casting CAD solid model. Custom designed purpose-built equipment delivers the highest quality engineered precision prototype castings and production castings. Advanced equipment designs ensure the precise investment ceramics processing and vacuum induction melting and casting necessary for today’s high-strength copper, stainless steel, nickel, cobalt chromium and titanium superalloy castings. RapidProtoCasting combines the most advanced industry ceramics with proprietary investment casting processes to deliver complex precision castings within days of receiving a new customer design. From CAD model to lost wax investment casting to final inspection, RapidProtoCasting’s rapid manufacturing delivers prototype castings with production quality in days. Picking the right people and training them to perform consistent standardized operations and high quality special operations customized to each new customer part quickly delivers prototype quantities of precision parts capable of meeting quality standards found in engineered high-volume production processes.